Crab might be part of the seafood niche, but it really deserves a group all its own. There’s no wrong way to enjoy this tasty crustacean: crab legs, crab claws, crab cakes, crab soup, crab bites—anything goes! Get some of the tastiest crab around at these 10 best places for crab in Georgia. More than a tourist attraction, this place knows how to do crab right. Crab stew, deviled crab, Alaskan King Crab, snow crab, Dungeness crab, stone crab, Jonah crab, and local blue crab give you one of the most crab-heavy menus to choose from. If you’re not sure where to start, consider a combo plate that combines some of their best seafood dishes. This charming little eatery reflects the rich history and vibrancy of the town, but its ambiance takes a backseat to the food. Fans rave about the snow crab legs and crab cakes, along with crab sandwiches for lighter appetites. And make sure you save room for a complimentary bowl of soft-serve ice cream. Atlanta’s premiere seafood destination features some of the best crab in the state. Chesapeake-style crab legs and King crab are clear winners on this star-studded menu. They’ve even better when you pair them with one of their top-notch steaks for a surf and turf meal that’s simply amazing. Their biggest claim to fame is the weekend seafood buffet, and yes, their lineup includes crab legs! Eat all you want for one low price, truly the dreams of those who can’t get enough crab legs. You will pay a little extra for your buffet price if you want crab legs, but since they’re all you can eat, it’s well worth it! This hidden lakeside gem offers stunning views of Lake Lanier, along with a killer seafood menu you can’t help but crave. Crab sliders (they call ‘em extremers), shrimp and crab dip, crab cakes, and Alaskan snow crab legs are in abundance. If you just can’t get enough, you can add a crab cake or cluster of crab legs to your order and ensure you get your fill. All the best flavors of the Lowcountry can be found in Northeast Georgia. Open for dinner and brunch, they’re serving up tasty crab cakes and sherry crab bisque, Lowcountry-style. And their eggplant pirogue stuffed with crab meat and shrimp is a can’t miss! It’s not just a name: they really do have some of the most tender, juicy crab dishes you’ve ever tasted! 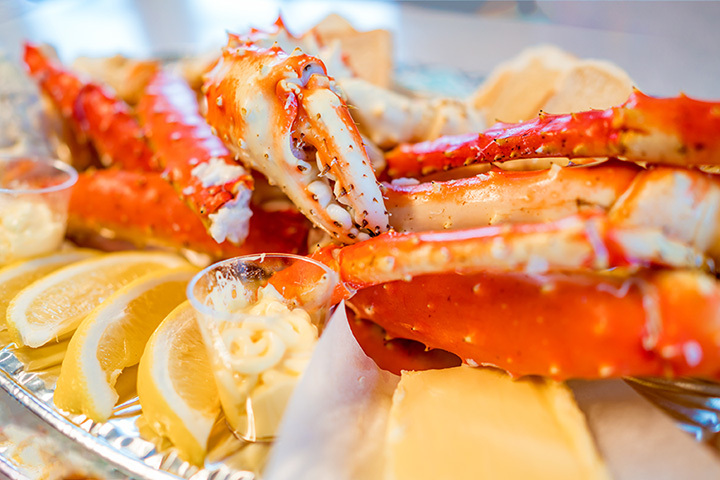 This award-winning crab house has something for every appetite, including blue crab, snow crab legs, Dungeness crab, and King crab. There’s a ton of other seafood and land fare filling out the menu to satisfy everyone in your group. Fresh, wild caught crab legs are a favorite item at this roadside seafood market. But if you’re not in mood to take some home and cook them yourself, you can sit down to a freshly prepared hot meal in store. Favorites like soft shell crab, crab claws, and crab po'boys come with French fries and coleslaw for a filling meal you’ll want to savor. The crab cakes here are simply divine, just like everything else on the menu. Fans love coming here to pick up crab for special occasions because it’s every bit as good as what you’ll find on the coast. The atmosphere almost makes you forget you’re in the mountains and not at the beach. This breezy seafood favorite makes every meal feel like a trip to the Gulf. There’s a crab dish for every sized appetite, including crab cakes, dips, soups, and huge clusters of crab legs. Portions are large, so you may even stretch one meal into two!